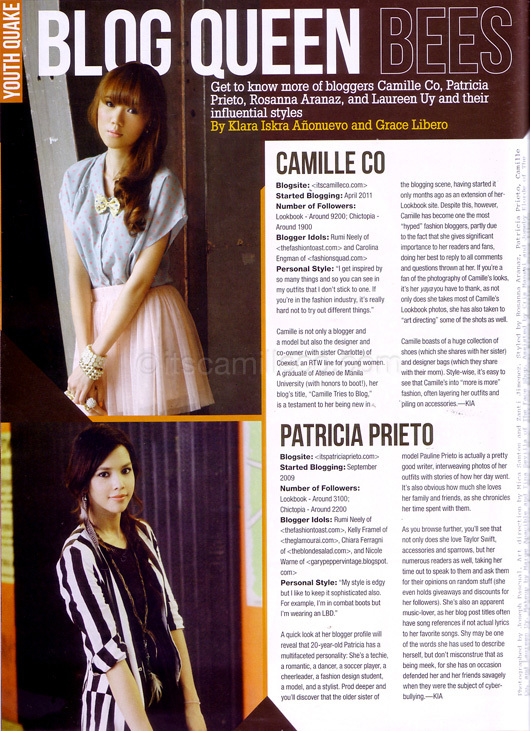 I was featured alongside bloggers Patricia, Laureen and Rosanna in this month’s MEG Magazine. I have the highest respect for these girls so I’m more than happy to be sharing this feature with them. Plus, it’s never boring whenever we’re together. In fact, I have so much BTS photos from this shoot, I’m making a separate entry just for them! Little tidbit, guess who personally handpicked us for this feature? No less than the perfect role model for the youth, Bianca Gonzales herself. She’s currently the guest editor for MEG. I must say, she’s got some time management skills! She’s so hands-on. She was there during our entire shoot, making sure everything was going as planned. I really think she’s perfect for the job. If you haven’t grabbed yourself a copy of MEG Magazine’s September issue, please do so! You won’t regret it!